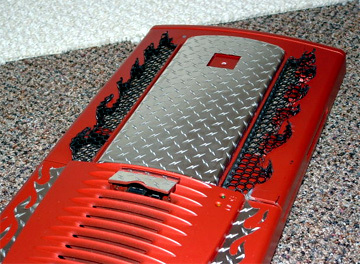 Create an extreme look for your case, mods, peripherals, or anything else you can think of (watch out Fido!) with new diamond plate adhesive film! The material is soft and flexible allowing it to conform to contours and bend easily. After applying the Vinyl Sheet, you simply trim the excess vinyl with a sharp blade or hobby knife (not included). What you have left is a customized look without the head aches and costs associated with painting. Looks and feels like real diamond plating. Apply to Power Supplies, Cases, Monitor, Keyboard, Mouse, Drive faces, Headphones, Bezel, Fan controllers, Toggle switches etc.